Ask yourself, is answering a text message or checking your Snapchat at the dinner table worth covering the tab of everyone’s meal? 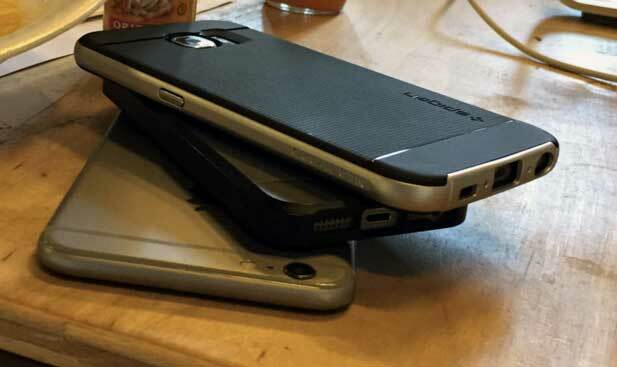 Phone Stacking puts that question to the test. It’s one of the most brilliant social etiquette games of our generation -- also one of the saddest, if you let its value-prop sink in far enough. The rules of the game are simple. You’re out a restaurant with friends, as soon as you sit at the table, everyone stacks their phones, face down. You can put them in a pile in the center for dramatic effect, or you can keep them next to your individual plate. Either way, first person to reach for their phone during dinner is now responsible for paying for the entire meal. Seriously. Don’t even touch the phone. If by some miracle you and your friends make it through dinner without anyone checking for stray text messages, just split the bill the way you normally would. Next time you’re at dinner -- hell, you might be at dinner right now -- look around the table. How many of your friends have their neck craned down at their cell phone? The moment is so far removed, we need a gimmicky social game like this as a catalyst for a tech-free dinner. The game isn’t new either -- it first started surfacing around the web early 2012, with articles touting its significance in our increasingly “smart phone heavy” culture. Yet here we are, almost 4 years later, even more of a culture fueled by our social media connection, and dinner hasn’t changed much. It’s a matter of little wins that makes a game like Phone Stacking so rewarding. It might seem trivial, but we’ve now grown accustomed to connectivity. If your mom texts you and you don’t respond within minutes, she assumes you’ve been abducted. If you miss a call from your girlfriend, she assumes you’re out gallivanting with whores. All of these assumptions are made because they know you’re on your phone. Or by your phone. And there’s no reason, other than being abducted, that you shouldn’t be able to answer. But are all these connections immediately necessary? It isn’t until you take the phone out of the equation for small periods of time, even 30 or 60 minutes, that you realize that text message could have waited. That Snap will still be there. Your individual moment gets valued. Well, if your friend can’t help but check Snapchat during dinner, you’re bound to get a free meal -- so enjoy. Realistically, even if you play this game once a month, it’s astonishing what truths you’ll uncover about the friend sitting across from you when the phone is taken out of the equation. No one is saving the world by “Stacking phones” for a 60 minute dinner. It’s simply a reminder to enjoy slices of life. And if you can’t remember, paying for your friends dinner might do the trick.